Japanese animated film-maker Studio Ghibli, whose hits including Oscar winner Spirited Away, has announced a halt in production. Co-founder Toshio Suzuki told Japanese television the company was likely to undergo an overhaul, although a total end to film-making has been discussed. The changes come after lead director Hayao Miyazaki retired from the anime makers in September. 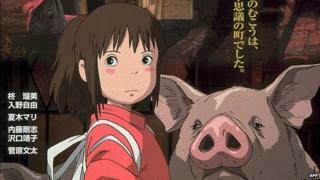 His hit Spirited Away won the Academy Award for best animation in 2002. Howl's Moving Castle landed an Oscar nomination two years later, while Miyazaki's work has been credited with bringing Japanese animation to a broad global audience. Suzuki said in his TV appearance: "It is by no means impossible to keep producing [movies] forever. However, we will take a brief pause to consider where to go from here." He added that a period of "housecleaning" was necessary after the departure of Miyazaki, and would be needed to allow new animators and directors to make their mark. The studio has admitted that the departure of its most recognisable film-maker has caused them to reconsider the future. Some media outlets initially reported that the anime studio was ceasing production entirely and would exist with a much smaller staff to deal with rights for its existing output in film, video games and merchandise. But reports were amended after Suzuki's appearance on Japan's TBS network had been precisely translated. Studio Ghibli has made animated movies for almost 30 years, with other hits including Princess Monoke and My Neighbour Totoro. The Wind Rises was Miyazaki's swansong feature last year which premiered at the Venice Film Festival. There have been two subsequent Ghibli releases which were made by other directors, the most recent being When Marnie Was There, which came out in Japan last month.